You can make your own original paper gift tags. They are so easy to make and they make your gift look very personal. You can make a tag and personalize them to fit any occasion. Just think of all the gifts you give and fit the tag to that gift. Scraps of paper in different colors. Straight and decorative edged scissors. Paper punches with desired shapes. Ribbons, glitter or anything else you would like to use to decorate your paper gift tag. Use your straight or decorative scissors to cut a desired shape from ivory or white paper. This is the piece of paper you will write on. To make a lacy edge, first cut the edge of the paper with a scalloped edged scissors. Then, use the paper punch to create holes within the scallops. Cut the backing paper from a darker color as shown in the picture above. Use the craft glue to adhere your light colored paper to the backing paper. You can use the paper punches to make your desired shapes. In the example above I used a Cherub punch to make cherubs on one of my gift tags. 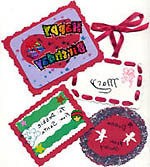 You can use all kinds of things to decorate your tags such as glitter, ribbons, feathers and you can even use beads. You can also make your own note cards, greeting cards and more using this very fun and easy technique. Also, if you prefer to write on dark colored papers, try writing with a pen that has white, silver or gold ink.